Helping a product team see a market through a Jobs-to-be-Done lens is often a transformational experience. This canvas can help drive that transformation — and company growth. 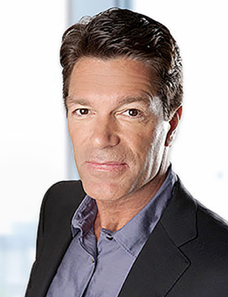 Learn the fundamentals of Jobs-to-be-Done Theory and the Outcome-Driven Innovation process. Establish a common language for innovation, thus facilitating agreement on critical process inputs. See their markets through a new lens — one that aligns them more closely with customers and results in a more predictable approach to innovation. Discover possible opportunities for growth, i.e., where current offerings fail to address a job step, outcomes or related or consumption jobs. My hope is that innovation champions in companies around the world will use the Jobs-To-Be-Done Canvas to accelerate the adoption of new thinking — and accelerate their growth. The canvas can be downloaded in multiple formats. You will not be required to enter any data — the links go directly to the canvas. Download the Jobs-To-Be-Done Canvas in .pdf format. 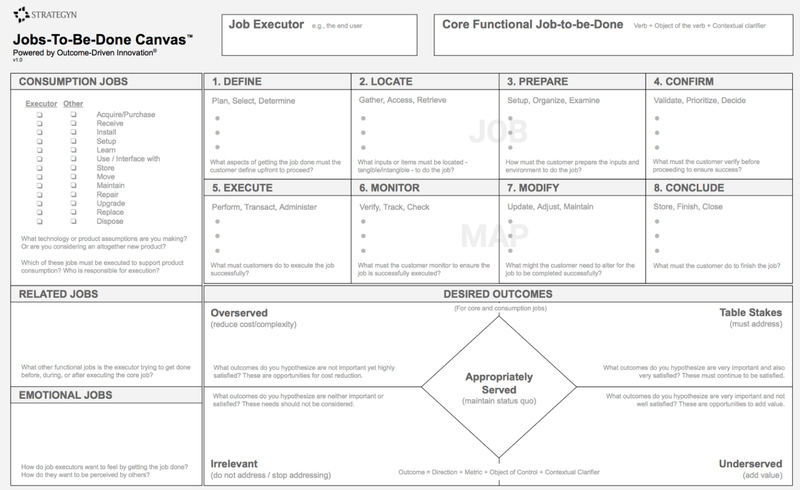 Download the Jobs-To-Be-Done Canvas in .png format. A special thanks to Mike Boysen for his contributions to creating the canvas. Please post suggested improvements to the canvas as a response to this article. If you want workshop participants to be fully educated on the approach before the workshop begins, ask them to download and read a free copy of the book JOBS TO BE DONE: Theory to Practice (Ulwick, 2016) in advance of the session. Workshop facilitators should be well versed in all the content listed above and supplement their learning by reading the white papers located on the Strategyn web site and the articles posted on the JTBD + ODI web site. The use of a canvas in a workshop setting has been made popular by Alexander Osterwalder and others. The canvas culture originated as part of The Toyota Way, where they developed what they called an “A3 Report” — a one-page report that got its name from the size of the paper. At first glance, A3’s look very simple. But, there is a process behind them. Like the A3 Report, the Jobs-To-Be-Done Canvas is intended as a starting point to develop a hypotheses about a market of interest that can later be refined and validated through a more rigorous execution of the ODI process. While the canvas can be used to analyze markets in which products do not yet exist, it is often more pragmatic for an innovation champion to help a product team learn the approach by focusing on a market they are familiar with, e.g., a market they are already in. This ensures the workshop will deliver actionable results that can be implemented quickly, thus building excitement around the process. What group of customers to target for growth. What job the customer is trying to get done. All the steps that comprise the customer’s job-to-be-done. Associated consumption, related and emotional jobs. The customer’s desired outcomes (needs) associated with getting the core and consumption jobs done. The canvas is designed to tease out these inputs, all of which are required to make the innovation process more predictable. The exercise can typically be completed in 1/2-day workshop. Begin by defining the group of people you want to target for value creation — those who use your products (and competing products) to get a common functional job done. The job executor is typically the end user — the person who uses the product or service to get the job done. The job executor does not have to be, and is often not, the buyer. Others involved in the product life cycle, e.g., installers, those who maintain or repair the product, etc., are considered when analyzing the consumption chain jobs. Next, define the common underlying process (job) the job executors are trying to get done. A well crafted job statement describes precisely what your targeted group of people are trying to accomplish or achieve. Avoid the use of adjectives and adverbs. Do not include emotional jobs or need statements in the core job statement. You may choose to have customers in the workshop with you to help you define their job. This brings an added dimension of realism to the session. A job map is a visual depiction of the core functional job, deconstructed into its discreet process steps. Unlike a process map, a job map does not show what the customer is doing (a solution view); rather, it describes what the customer is trying to get done (a needs view). For each stage in the job map, determine the process steps that the customer is trying to execute in order to get the job done. There are often a number of process steps for each stage in the Universal Job Map (which is embedded in the canvas). For example, there may be two or more execution steps or monitoring steps, etc. Define each step in the job map in a way that makes it solution agnostic. Place the steps in the optimal order: one that would eliminate process iterations that waste time and money. Enabling customers to execute the job in the optimal order is often an innovation in and of itself. You can read more about Job Mapping here. Consumption chain jobs are the product-related jobs that must get done throughout the product lifecycle. These jobs include installation, set up, and storing, transporting, maintaining, repairing, cleaning, upgrading, and disposing of the product. Some consumption chain jobs may be executed by the core functional job executor. Other consumption jobs may be executed by somebody else, e.g., an installer, etc. Identify all the consumption chain jobs that either the job executor or others must execute throughout the product lifecycle. Check off who it is that must execute the consumption chain job, i.e., the job executor or somebody else (other). In an existing market, the consumption chain jobs are often a given. But one goal of innovation is to create solutions that eliminate or automate the execution of the consumption chain jobs — thus offering a point of differentiation. List the functional jobs the end user is trying to get done in conjunction with the core functional job. They include jobs they might execute before, during or after the execution of the core job. (See Grow Past The Core: Target Related Jobs-to-be-Done). Create a set of statements that describe the way customers want to be perceived by others or feel when executing a core functional job. Again, follow the rules for creating valid emotional job statements as defined in the literature. Desired outcomes are the metrics that job executors use to measure the successful execution of the core functional job. Outcomes can be over, under or appropriately served, or table stakes or irrelevant. Define outcomes for several of the steps in the job map. It’s often best (and easiest) to start with the “execution” steps. Follow the rules for stating good outcome statements per the latest book listed above. Use the required format: direction of improvement + metric + object of control + contextual clarifier (optional). As outcomes are defined, discuss with the team whether they are likely to be under, over or appropriately served, or table stakes or irrelevent (and why). How to better position existing products. 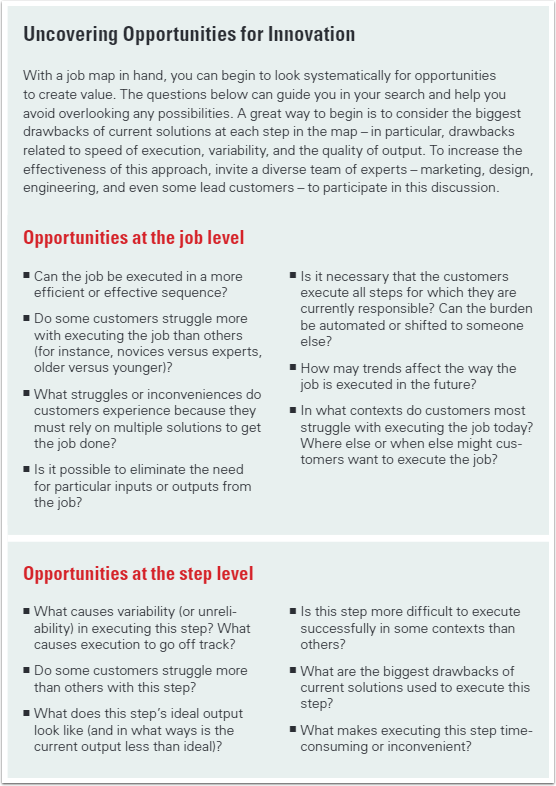 How to improve existing products at the job, job step and outcome level (see details below on how to use the job map to uncover opportunities for innovation). What new products or complementary services are required to help customers get the entire job done. Additional instructions for using the insights are detailed in the Harvard Business Review article, The Customer-Centered Innovation Map.